and even sometimes find themselves cleaning up the little "accidents" made by the pets. Giffie-Pet Staff Board Room, for Giffie-Pet Staff members only. Malevolent [Stephen]: The Owner and Overseer of the Giffie Store and all related pages. He appoints new staff, retires old staff, and gives out duties to current staff to fulfill. [Anvikit] came up with the idea for the Giffie-Pets, and created many original pets. [Big Brother] took place as head of the Pet Store once [Anvikit] retired. [Bookwyrm] was the next person in charge, once [Big Brother] handed leadership to her. [Stephen] took over for [Bookwyrm] when she retired. [Bookwyrm] stole the store back from [Stephen]. [Stephen] once again took over the store, upon [Bookwyrm]'s retirement. The Giffie Artists have created the pets. 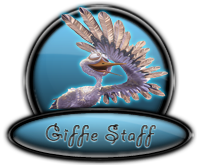 Also, thank you to the retired Giffie-Pet Staff who have all helped in the past. 2011-07-31 [Ihsahn]: It's alright. I just don't want negativity, I want this site to be happier. 2011-08-21 [The Giffie Fairy]: I'm a pretty fluttery fairy! I'm a fairy assistant... that so gives me the idea of me fluttering around with fairy wings. 2011-09-13 [Bookwyrm]: :D Well I did upgrade to Universe...for a few seconds. But the masses were just so pleased with my rule that I became Queen of the Multiverse within less than a minute! 2011-09-19 [Shatureel]: Laughs, you guys are a riot. Quick response for one with so much under her control. 2011-09-21 [Shatureel]: LOL, she is fast, thats why she is Queen. 2011-11-05 [sammie h! ]: I wish I could work on here.